Brought to you by the instructors at the Center for Book Arts, Bookforms is a comprehensive guide for making books by hand with a focus on functionality in design. Written by the experts at the Center for Book Arts in New York, Bookforms presents all the instruction you need to craft by hand a comprehensive array of historic bookbinding styles from all over the world. Bookforms traces the functional roots of each structure, explains their appropriateness for various uses, and provides projects for making an essential structure for each style of binding. 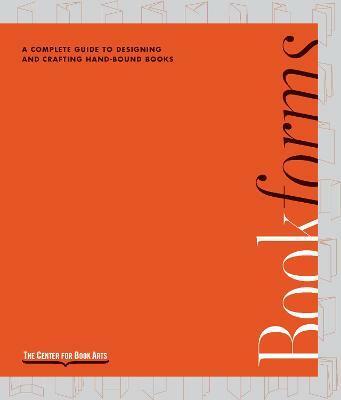 Bookforms tackles a wide range of projects for all levels of bookbinders. You'll see everything from sewn and ticketed blank books and traditional western codex book forms, to scrapbooks and albums, Asian stab-sewn bindings, unusual structures, and aesthetics/embellishments. What better time to dive into this venerable and unique hobby than now? The Center for Book Arts is one of the few contemporary arts organizations dedicated to the art of the book. Founded in 1974 in Manhattan, it was the first not-for-profit organization of its kind in the nation, and has since become a model for others around the world. The Center promotes active explorations of both contemporary and traditional artistic practices related to the book as an art object. It facilitates communication between the book arts community and the larger spheres of contemporary visual and literary arts. They achieve their mission through exhibitions, classes, public programming, literary presentations, opportunities for artists and writers, publications, and collecting.